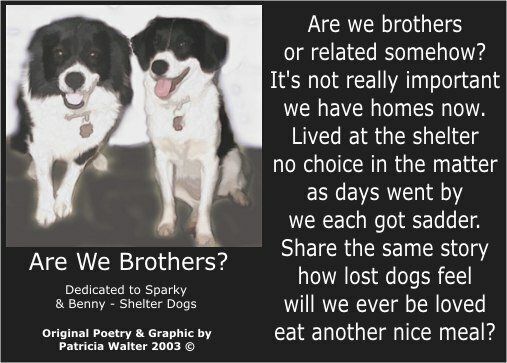 Benny and Sparky both ended up at our house. The shelter seemed to have nothing but Border Collie mixed puppies for months on end. Benny finally went to live with another family since he often got into fights with several of our large male dogs. We felt it best for him to live in a home where he could be king. So he went to live in Dover DE where he was the only dog in the house. Sparky stayed with us while we tried and tried to find him a new home. He was on some of the rescue websites for almost a year. Finally, we just decided to let him stay with us since he felt so at home here. We had a few people interested in adopting him, but they were never right. One man wanted him to run his golf course with him while he did maintenance work. I was not sure that Sparky would obey and stay with the man. Someone else wanted to adopt him, but they were away many long hours a day. He had been use to living with a nice doggie family and having us around most of the time. So I decided he might not like being home alone 10 or more hours a day. Benny had lived at the shelter for more than 3 months. He was the cutest puppy, but no one wanted to adopt him. Finally I decided that he was not getting any training or attention at the shelter and brought him home. I think living at a shelter in a small steel cage for over 3 months did emotional harm to Benny. I think that is one of the reasons that he seemed afraid of many things and ended up fighting with the dogs so often. Puppies, just like people, need attention and socializing when they are small. Sometimes they can overcome a bad start in life and other times they have a difficult time being a normal tempered dog. Sparky was such a beautiful dog when he was picked up as a stray at the shelter. He was 9 months to a year old. He has not changed one bit since the first day I met him there. He was so friendly and handsome. I could never understand why his owners never came looking for him. He had become so sick at the shelter that he could not even stand up. Our shelter is a very poor shelter and did not have money to buy medicine for dogs with kennel cough. So I carried Sparky out of the shelter and to the vets to be treated. The kennel cough strain at our shelter is a tough one and often leaves the dogs with a permanent cough. Sparky's throat was probably damaged, according to the vet, and you can't even pull on his collar without him choking and coughing. He requires a harness to walk him. But he is the most loving and beautiful dog. Benny seemed to be a Border Collie and Beagle mix while Sparky seemed to be a Border Collie and Husky mix. He has the most beautiful full coat which seems very typical of a northern breed dog.